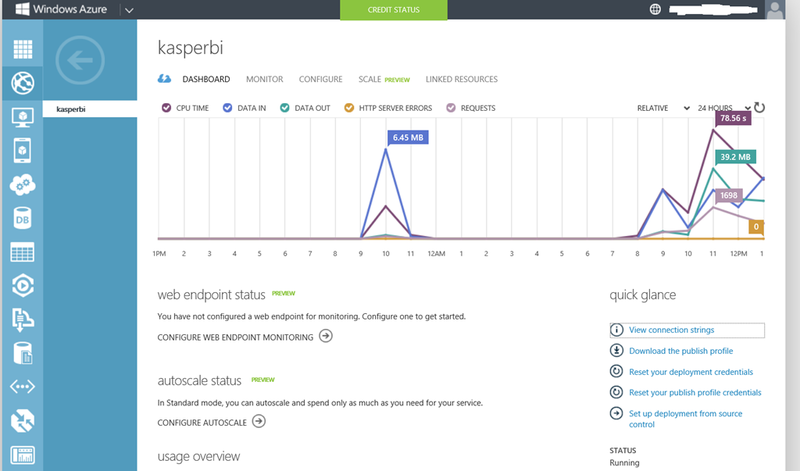 Moved the blog over to Windows Azure, here is how I did it. Last night I moved the blog over from my personal hosting provider to Windows Azure. It turned out to be pretty smooth sailing. Here is how I did it. I followed step 1 to the teeth and it worked flawlessly and I setup my blog on http://kasperbi.azurewebsites.net/ as a free site (yes absolutely free !). I then proceeded with step 2 and successfully copied the files using FTP. Resist the urge to start playing with it, and most of all DO NOT register jetpack yet. 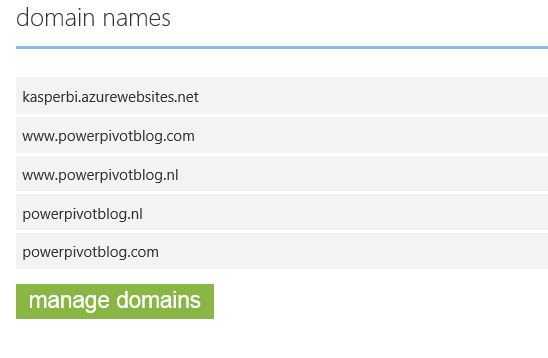 Also don’t change the URL for the blog in the WP admin yet. Observe that the <name> part can be different for each wordpress installation, well get to that in a second. the good thing about using Azure is that if you screw it up you can quickly delete the site and recreate it (I had to do it once). This loaded the posts and comments successfully over to the Azure site. Next I configured the theming and plugins and the wordpress comment is working successfully. Now for the part where I want to move over my domain names (kasperonbi.com and .com) to the Azure wordpress site, the Part 3: Setting Up Your Custom Domain blog post covers it in great detail and that just worked for me. If you want to use your own domain names you can’t use the free version so I changed my site from free to shared. Now the blog starts costing some money. I am using my MDSN benefits to cover for this (Reading Dave’s blog it is OK to use the MSDN benefits for your blog). I did not have to go through step 4 and 5 of Dave’s blog.